We like to welcome our new arrival, Chatmar First Ice Breaker, a lovely little boy with an interesting pedigree for the future. We would like to thank Cath Bond and Mac McCarthy for entrusting us with this little jewel. New pictures of Nizhoni's First Class Hero, who has come back to stay with us temporarily. He will be rehomed shortly. Critiques on their respective pages. New pictures of Nizhoni's First In Line and Nizhoni's First Born Barbie, together. New pics of Nizhoni's First Class Hero "Loke"
New pictures added of Nizhoni's First In Line "Bravo"
Thank you so much, Linda Collins, Sophie Jouannet and Karen P. Johnson, for the pictures!!! Check out puppy plans... Some exciting news for the future!!! Congratulations to Pat and Sheila with Nizhoni's Me First, who was Best In Specialty Show puppy!!!! You make me so proud!!! New pics hopefully coming soon! We have had a very nice weekend with double show in Bergen. 26.09.09 was Norwegian Belgian Shepherd Clubs avd. Hordaland regional specialty. Added pics of Grimmendans Gigi doing her mentaldescription- Thank you Freddy Bukkøy for the pictures. she is now: R.H. N UCh Chevy's Kahroma. The RH title means Recommended Dog / Rekommendert Hund. We have moved to a new house, so our home address is changed. Check out Contact for the new information. Chevy's Kahroma and Grimmendans Gigi has gone their mentaldescriptions (MH) today. Today Nizhoni's My First Pepsi was at her first Puppy Show at Hønefoss Hundeklubb, she was BOB!!! Congratulations to Hege & Pepsi for a very nice first outing !!! Best of luck in the future!!!! Check Puppy page, our friends at kennel Fauve Art has some promising boys for sale. Nizhoni's Me First in USA was at a puppy show right after our last update, and he became Best of Breed and 2nd Best in Group, only 12 weeks old!!!! Congratulations to Pat Morgan and Sheila Walker!!! Way to go!!! Only one puppy left to go to his new home, and the others are well settled in their new homes. The puppies has started to move to their new homes. also new (almost) 8 weeks pics of all except Black and Pink who left that day. Yesterday all the pups went to the Vet. And all puppies are very healthy, and the Vet was very happy with them all. Pups are now vaccinated and microchipped. Due to a cancellation we have 1 male puppy for sale. I am so sorry... Puppies take so much time, so new updates come a little late. thanks also to Eli Andrea Foss Baldersheim, for sharing some from her visit. New pictures of the puppies 5 weeks - in addition to this, I have 2 little videos as well. New pictures of the puppies 4 weeks. Both individual and pictures of them enjoying "outside life". New pictures of the puppies 3 weeks. All puppies are growing nicely, and are healthy. Put up pedigree sites on the main linkpage. good bone, forechest needs development, moves irregular, excellent temperament"
Kennel Certavia has a new website address. He then became Europasieger 2009. So now Gabor is: Bundesjugendsieger-08 VDH Europasieger-2009 VDH JCh Grimmendans Gabor. Congratulations to Gabi Müller from us and Gigi! New pictures of the puppies 2 weeks! she was 1.Exc Intermediate Class (Unghundklasse), CK and 4th best female.!!! Judge: Paul Lawless, breed specialist from Kennel Revloch, Ireland. Critique and lots of pics will come soon. All the puppies are now spoken for. New pictures of the puppies 1 week. Congratulations also to Paula & Firmin Aertgeerts, with their fantastic weekend at the international show in Goes, NL. and can now show to a new title: Dutch Champion!!!! Hugs from us all!!!! All the puppies are doing well and growing rapidly. and she manage to give us 4 boys and 3 girls. Mother and babies are doing well. A thank you goes to: Linda & Ronny, Torill and Alyn for help and guidance through Romas (and my) first birth. GREAT NEWS!!!! Ultrasound today showed that Roma is indeed pregnant! The first show of the year is done. exc. bone, nice feet, well angulated, moves with characteristic stride, exc. coat, manageable." 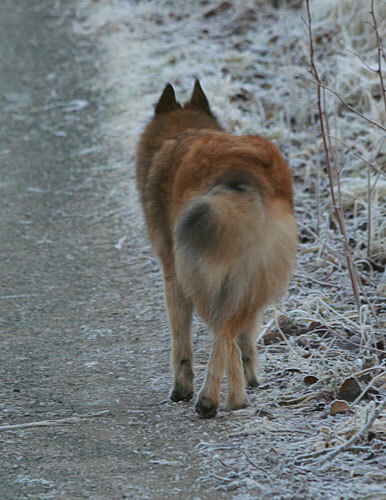 I have also forgotten to update that N UCh Chevy's Kahroma was nr.10 of all Tervueren in in dogshows in Norway 2008. Finally the day came that we have been waiting for so long. Friday 13. February, 2009, we left for Holsbeek, Belgium, to meet the gorgeous Grimmendans Fourlan. Saturday 14. and Sunday 15. we got successful matings, and now we hope for puppies from our Chevy's Kahroma around 18.april 2009. Check our puppy plans for more info. Big news :D Roma is finally in season. So maybe during next week we will go to Belgium and mate her to the Gorgeous Fourlan. Changed the menu a bit. So that it's easier to navigate between litters, puppies and future plans.